A new release from an up and coming hip hop artist/producer adds a much needed soundtrack to the new-found activism that is energizing young men and women of color. 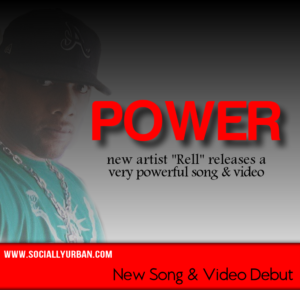 The song is “Power” and the artist’s name is Rell. He gave me an interview and allowed Socially Urban to debut the new song and video. The full interview can be read below the video. Thanks for sitting down with us. What inspired the song “Power” and what message were you hoping to get across with it? The lyrics in the hook says “you have the power to change it all”. Is that message specifically for the youth of today? If so how hopeful are you that the new generation can change it all? It’s pretty incredible that you did all of this yourself, and I think the finished product is impressive. How long did it take to write record and shoot a full video for this song? I think this kind of music is very much in need right now in this racially charged political environment. When can we expect a full album like this from you? I’d like to thank Rell for letting us debut his new video and letting us ask him a few questions. You can follow Rell at www.twitter.com/RellDaProducer and www.instagram.com/RellDaProducer to get updates on his new material. Positive music with substance. Hip hop needs more rappers who do this kind of stuff. Never heard of this new artist before but I really like this song. I hope I can find more of his music somewhere.